"Chicagoland" redirects here. For other uses, see Chicagoland (disambiguation). 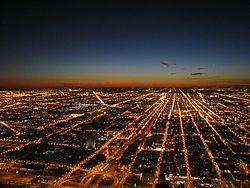 The Chicago metropolitan area, or Chicagoland, is the metropolitan area that includes the city of Chicago, Illinois, and its suburbs. With an estimated CSA population of 9.9 million people and an MSA population of 9.5 million people, it is the third largest metropolitan area in the United States. The Chicago metropolitan area is one of the world's largest and most diversified economies, with more than four million employees and generating an annual gross regional product (GRP) of $680 billion in 2017. The region is home to more than 400 major corporate headquarters, including 31 in the Fortune 500. There are several definitions of the area, including the area defined by the United States Office of Management and Budget (OMB) as the Chicago–Joliet–Naperville-Aurora, IL–IN–WI Metropolitan Statistical Area (MSA), and the area under the jurisdiction of the Chicago Metropolitan Agency for Planning (CMAP) (a metropolitan planning organization). The Chicago Metropolitan Statistical Area was originally designated by the United States Census Bureau in 1950. It comprised the Illinois counties of Cook, DuPage, Kane, Lake and Will, along with Lake County in Indiana. As surrounding counties saw an increase in their population densities and the number of their residents employed within Cook County, they met Census criteria to be added to the MSA. The Chicago MSA, now defined as the Chicago-Naperville-Elgin, IL-IN-WI Metropolitan Statistical Area, is the third largest MSA by population in the United States. The 2015 census estimate for the MSA was 9,532,569, a decline from 9,543,893 in the 2014 census estimate. This loss of population has been attributed to taxes, political issues, weather, and other factors. The Chicago MSA is further subdivided by state boundaries into the Chicago-Naperville-Joliet, IL Metropolitan Division, corresponding roughly to the CMAP region; the Gary, IN Metropolitan Division consisting of the Indiana counties of Lake and Porter, as well as two surrounding counties; and the Lake County-Kenosha County, IL-WI Metropolitan Division. The OMB also defines a slightly larger region as a Combined Statistical Area (CSA). 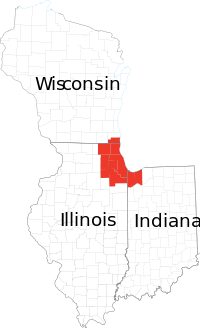 The Chicago–Naperville, IL–IN–WI Combined Statistical Area combines the metropolitan areas of Chicago, Michigan City (in Indiana), and Kankakee (in Illinois). This area represents the extent of the labor market pool for the entire region. The CSA has a population of 9,928,312 (2014 estimate). The Chicago urban agglomeration, according to the United Nations World Urbanization Prospects report (2011 revision), lists a population of 9,545,000. The term "urban agglomeration" refers to the population contained within the contours of a contiguous territory inhabited at urban density levels. It usually incorporates the population in a city plus that in the surrounding area. Chicagoland by county and state. A map of Chicagoland in relation to the states of Wisconsin, Illinois, and Indiana. Chicagoland is an informal name for the Chicago metropolitan area. The term Chicagoland has no official definition, and the region is often considered to include areas beyond the corresponding MSA, as well as portions of the greater CSA. Colonel Robert R. McCormick, editor and publisher of the Chicago Tribune, usually gets credit for placing the term in common use. McCormick's conception of Chicagoland stretched all the way to nearby parts of four states (Indiana, Wisconsin, Michigan, and Iowa). The first usage was in the Tribune's July 27, 1926 front page headline, "Chicagoland's Shrines: A Tour of Discoveries", for an article by reporter James O'Donnell Bennett. He stated that Chicagoland comprised everything in a 200-mile (320 km) radius in every direction and reported on many different places in the area. The Tribune was the dominant newspaper in a vast area stretching to the west of the city, and that hinterland was closely tied to the metropolis by rail lines and commercial links. Today, the Chicago Tribune's usage includes the city of Chicago, the rest of Cook County, eight nearby Illinois counties (Lake, McHenry, DuPage, Kane, Kendall, Grundy, Will, and Kankakee), and the two Indiana counties of Lake and Porter. Illinois Department of Tourism literature uses Chicagoland for suburbs in Cook, Lake, DuPage, Kane, and Will counties, treating the city separately. The Chicagoland Chamber of Commerce defines it as all of Cook, DuPage, Kane, Lake, McHenry, and Will counties. In addition, company marketing programs such as Construction Data Company's "Chicago and Vicinity" region and the Chicago Automobile Trade Association's "Chicagoland and Northwest Indiana" advertising campaign are directed at the MSA itself, as well as LaSalle, Winnebago (Rockford), Boone, and Ogle counties in Illinois, in addition to Jasper, Newton, and La Porte counties in Indiana and Kenosha, Racine, and Walworth counties in Wisconsin, and even as far northeast as Berrien County, Michigan. The region is part of the Great Lakes Megalopolis, containing an estimated 54 million people. The city of Chicago lies in the Chicago Plain, a flat and broad area characterized by little topographical relief. The few low hills are sand ridges. North of the Chicago Plain, steep bluffs and ravines run alongside Lake Michigan. Along the southern shore of the Chicago Plain, sand dunes run alongside the lake. The tallest dunes reach up to near 200 feet (61 m) and are found in Indiana Dunes National Park. Surrounding the low plain are bands of moraines in the south and west suburbs. These areas are higher and hillier than the Chicago Plain. A continental divide, separating the Mississippi River watershed from that of the Great Lakes and Saint Lawrence River, runs through the Chicago area. A 2012 survey of the urban trees and forests in the seven county Illinois section of the Chicago area found that 21% of the land is covered by the tree and shrub canopy, made up of about 157,142,000 trees. The five most common tree species are buckthorn, green ash, boxelder, black cherry, and American elm. These resources perform important functions in carbon storage, water recycling, and energy saving. As of the 2010 Census, the metropolitan area had a population of 9,729,825. The population density was 1,318 per square mile. The racial makeup was 52.8% Non-Latino White, 22.1% were Latino, 16.7% were Non-Latino African Americans, and 6.4% were Asian. Other ethnic groups such as Native Americans and Pacific Islanders made up just 2.0% of the population. The suburbs, surrounded by easily annexed flat ground, have been expanding at a tremendous rate since the early 1960s. Aurora, Elgin, Joliet, and Naperville are noteworthy for being four of the few boomburbs outside the Sun Belt, West Coast and Mountain States regions, and exurban Kendall County ranked as the fastest-growing county (among counties with a population greater than 10,000) in the United States between the years 2000 and 2007. Settlement patterns in the Chicago metropolitan area tend to follow those in the city proper: the northern suburbs along the shore of Lake Michigan are comparatively affluent, while the southern suburbs (sometimes known as Chicago Southland) are less so, with lower median incomes and a lower cost of living. However, there is a major exception to this.Template:What is it? While Chicago's West Side is the poorest section of the city, the western and northwestern suburbs contain many affluent areas. According to the 2000 Census, DuPage County had the highest median household income of any county in the Midwestern United States. According to the 2000 U.S. Census, poverty rates of the largest counties from least poverty to most are as follows: McHenry 3.70%, Dupage 5.9%, Will 6.7%, Lake 6.9%, Kane 7.4%, Cook 14.5%. In an in-depth historical analysis, Keating (2004, 2005) examined the origins of 233 settlements that by 1900 had become suburbs or city neighborhoods of the Chicago metropolitan area. The settlements began as farm centers (41%), industrial towns (30%), residential railroad suburbs (15%), and recreational/institutional centers (13%). Although relations between the different settlement types were at times contentious, there also was cooperation in such undertakings as the construction of high schools. Counties highlighted in gray were not included in the MSA for that census. The CSA totals in blue are the totals of all the counties listed above, regardless of whether they were included in the Chicago Combined Statistical Area at the time. ^ The Round Lake Beach-McHenry-Grayslake, IL-WI UA extends into Walworth County, WI, which lies in the Milwaukee CSA. ^^^^ The Genoa City, WI-IL UC extends into Walworth County, WI, which lies in the Milwaukee CSA. The Chicago metropolitan area is home to the corporate headquarters of 57 Fortune 1000 companies, which includes Boeing, McDonald's, Motorola, Discover Financial Services, United Continental Holdings, Walgreens, and Aon among others, representing a diverse group of industries. The area is a major global financial center, and Chicago is home to the largest futures exchange in the world, the CME Group (Chicago Mercantile Exchange). In March 2008, the Chicago Mercantile Exchange announced its acquisition of NYMEX Holdings Inc, the parent company of the New York Mercantile Exchange and Commodity Exchange. CME'S acquisition of NYMEX was completed in August 2008. A key piece of infrastructure for several generations was the Union Stock Yards of Chicago, which from 1865 until 1971 penned and slaughtered millions of cattle and hogs into standardized cuts of beef and pork. This prompted poet Carl Sandburg to describe Chicago as the "Hog Butcher for the World". In 2007, the area ranked first among U.S. metro areas in the number of new and expanded corporate facilities. It ranked third in 2008, behind the Houston–Sugar Land–Baytown and Dallas–Fort Worth metropolitan areas, and ranked second behind the New York metropolitan area in 2009. 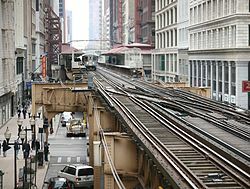 Chicago has been at the center of the United States' railroad network since the 19th century. Almost all Class I railroads serve the area, the most in the North America. Pace Suburban Bus operates suburban bus and regional vanpool, paratransit and ridematching services in the Chicagoland region. Amtrak operates Union Station which is the major Amtrak passenger rail hub with connections to Metra and the within a few blocks of connections to several 'L' lines. Interstate 41 (I-41) runs concurrent with Interstate 94 at the northern terminus of the Tri-State Tollway. Interstate 55 (I-55) is the Adlai Stevenson Expy. I-355 is the Veterans Memorial Tollway (formerly North-South Tollway). I-57 is unofficially the "West Leg" of the Dan Ryan Expy. I-65 has no name, whether official or unofficial. I-80 is officially called the Borman Expy (cosigned with I-94), Kingery Expy (cosigned with I-94 for 3 miles), Tri-State Tollway (cosigned with I-294 for 4 miles) and is unofficially called the Moline Expy west of I-294. I-90 is locally known as Jane Addams Tollway (formerly Northwest Tollway), John F Kennedy Expy (cosigned with I-94), Dan Ryan Expy (cosigned with I-94), and Chicago Skyway Toll Bridge. 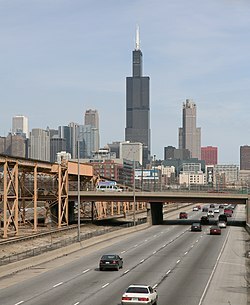 The Chicago Skyway is disputed since around 2000 if it actually is I-90. Currently it is signed as "To I-90" in both directions. I-190 is the John F. Kennedy Expy spur heading into Chicago-O'Hare Int'l Airport. I-290 is the Dwight D. Eisenhower Expy. I-94 is Tri-State Tollway in Lake County, Edens Spur, Edens Expy, John F. Kennedy Expy (cosigned with I-90), Dan Ryan Expy (cosigned with I-90), Bishop Ford Frwy (formerly Calumet Expy), Kingery Expy (cosigned with I-80) and Borman Expy (cosigned with I-80). I-294 is the Tri-State Tollway. US Routes in the Illinois part of the area include: US 6, US 12, US 14, US 20, US 30, US 34, US 41, US 45, and US 52. Historic US Route 66's eastern terminus is in Chicago. The Chicagoland Speedway oval track has hosted NASCAR Cup Series and IndyCar Series races. The Chicago Marathon is one of the World Marathon Majors. The Western Open and BMW Championship are PGA Tour tournaments that have been held primarily at golf courses near Chicago. The two main newspapers are the Chicago Tribune and the Chicago Sun-Times. Local television channels broadcasting to the Chicago market include WBBM-TV 2 (CBS), WMAQ-TV 5 (NBC), WLS-TV 7 (ABC), WGN-TV 9 (CW), WTTW 11 (PBS), MeTV 23, WCIU 26 (Ind), WFLD 32 (FOX), WCPX-TV 38 (Ion), WSNS-TV 44 (Telemundo), WPWR-TV 50 (MyNetworkTV), and WJYS-TV 62 (The Way). CLTV is a 24/7 local news provider available only to cable subscribers. Radio stations serving the area include: WBEZ, WMBI, WLS-AM, and WSCR. Elementary and secondary education within the Chicago metropolitan area is provided by dozens of different school districts, of which by far the largest is the Chicago Public Schools with 400,000 students. Numerous private and religious school systems are also found in the region, as well as a growing number of charter schools. Racial inequalities in education in the region remain widespread, often breaking along district boundaries; for instance, educational prospects vary widely for students in the Chicago Public Schools compared to those in some neighboring suburban schools. Historically, the Chicago metropolitan area has been at the center of a number of national educational movements, from the free-flowing Winnetka Plan to the regimented Taylorism of the Gary Plan. 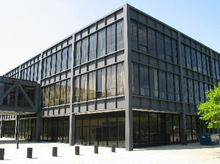 In higher education, University of Chicago founder William Rainey Harper was a leading early advocate of the junior college movement; Joliet Junior College is the nation's oldest continuously-operating junior college today. Later U of C president Robert Maynard Hutchins was central to the Great Books movement, and programs of dialogic education arising from that legacy can be found today at the U of C, at Shimer College, and in the City Colleges of Chicago and Oakton Community College in the Northwest suburbs. At the same time that the 708 area code was running out of phone numbers, the 312 area code in Chicago was also exhausting its supply of available numbers. As a result, the city of Chicago was divided into two area codes, 312 and 773. Rather than divide the city by a north/south area code, the central business district retained the 312 area code, while the remainder of the city took the new 773 code. ^ a b "Annual Estimates of the Resident Population: April 1, 2010 to July 1, 2014 - United States -- Combined Statistical Area; and for Puerto Rico 2014 Population Estimates" (CSV). United States Census Bureau, Population Division. March 2013. Retrieved April 1, 2013. ^ "Economy". 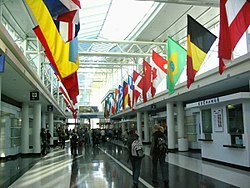 Worldbusinesschicago.com. Retrieved October 3, 2017. ^ "Combined statistical area population and estimated components of change: April 1, 2010 to July 1, 2016 (CSA-EST2016-alldata)". U.S. Census. Retrieved 2017-07-27. ^ Eltagouri, Marwa. "Chicago area sees greatest population loss of any major U.S. city, region in 2015". Chicago Tribune. Retrieved 2016-11-27. ^ "CSA-EST2009-alldata". United States Census Bureau. July 1, 2009. Archived from the original (csv) on July 8, 2010. Retrieved February 15, 2011. The MSA covers 7,214 sq. mi. of land area and 2,367 sq. mi. of water area. The total area of the MSA is 9,581 sq. mi. ^ As defined by Construction Data Company. ^ a b Fuller, Jack (2005). "Chicagoland". The Electronic Encyclopedia of Chicago. Chicago Historical Society. Retrieved February 20, 2010. ^ "The Press: The Colonel's Century". TIME. June 9, 1947. Retrieved 2010-02-20. ^ O'Donnell Bennett, James (July 27, 1926). "Chicagoland's Shrines: A Tour of Discoveries". Chicago Daily Tribune (1923-1963). Retrieved 2010-02-20. ^ "Classifieds map of Chicagoland". Chicagotribune.com. Retrieved 2011-05-30. ^ "About Chicagoland". Chicagoland Chamber of Commerce. Archived from the original on October 29, 2013. Retrieved October 25, 2013. ^ "Bidtool Coverage area: Chicago, Indiana, Wisconsin, Colorado, Kentucky project leads". Bidtool.net. Archived from the original on July 15, 2011. Retrieved May 30, 2011. ^ "Chicago Metropolitan Agency for Planning". Chicagoareaplanning.org. Archived from the original on August 12, 2006. Retrieved May 30, 2011. ^ "About - CMAP". Cmap.illinois.gov. Retrieved 2015-09-07. ^ "Urban trees and forests of the Chicago region". Nrs.fs.fed.us. 2013-09-17. Retrieved 2015-09-07. ^ "Regional Tree Census | The Morton Arboretum". Mortonarb.org. Retrieved 2015-09-07. ^ "Census Findings of Chicago Metropolitan Area" (PDF). The Chicago Community Trust. Retrieved July 1, 2015. ^ "Kendall County is fastest growing in the nation". Daily Herald. Retrieved May 30, 2011. ^ "Historical Metropolitan Area Definitions". Census.gov. Retrieved May 30, 2011. ^ "Alphabetically sorted list of UAs". U.S. Census Bureau. 2000. Retrieved August 6, 2010. ^ "Fortune 500 2008: States - Illinois". CNN. ^ Carl Sandburg. "Chicago". Poetry: A Magazine of Verse, vol. 3, no. 6 (March 1914):191-192. ^ RON STARNER. "TOP METROS OF 2007 - Site Selection magazine, March 2008". Siteselection.com. Retrieved May 30, 2011. ^ RON STARNER (March 9, 2009). "TOP METROS OF 2008 - Site Selection magazine, March 2009". Siteselection.com. Retrieved May 30, 2011. ^ "TOP METROS OF 2009 - Site Selection Magazine, March 2010". Siteselection.com. Archived from the original on July 2, 2011. Retrieved May 30, 2011. ^ Brat, Ilan (November 8, 2006). "Tale of a Warehouse Shows How Chicago Weathers a Decline". The Wall Street Journal. p. A1. Retrieved February 20, 2010. 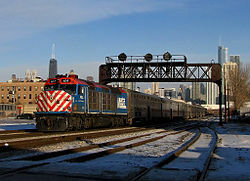 ^ "Chicago Highlighted as the US Railroad Capital by Trains Magazine". WTTW. February 23, 2017. Retrieved 2019-03-23. ^ "About CPS". Chicago Public Schools. Retrieved January 26, 2015. ^ Moore, Natalie (November 12, 2014). "Why so few white kids land in CPS — and why it matters". WBEZ. Archived from the original on January 17, 2015. Retrieved January 26, 2015. ^ Bogira, Steve (October 17, 2012). "Two students, two high schools, two divergent paths to college". Chicago Reader. ^ Thiede, Robert. "Gary Plan". Britannica.com. Retrieved January 16, 2015. ^ Sydow, Debbie; Alfred, Richard (2012). Re-visioning Community Colleges: Positioning for Innovation. p. 13. ISBN 1442214880. ^ Ronson, Jon (December 6, 2014). "Shimer College: The Worst School in America?". The Guardian. ^ "Great Books program". Oakton Community College. Retrieved January 26, 2015. Fischer, Paul B. (July 28, 1993). Racial and Locational Patterns of Subsidized Housing in the Chicago Suburbs: A Report to the MacArthur Foundation (Archive). Lake Forest, Ill.: Lake Forest College. Report to the MacArthur Foundation. Lewinnek, Elaine (2014). The Working Man's Reward: Chicago's Early Suburbs and the Roots of American Sprawl. Oxford: Oxford University Press.